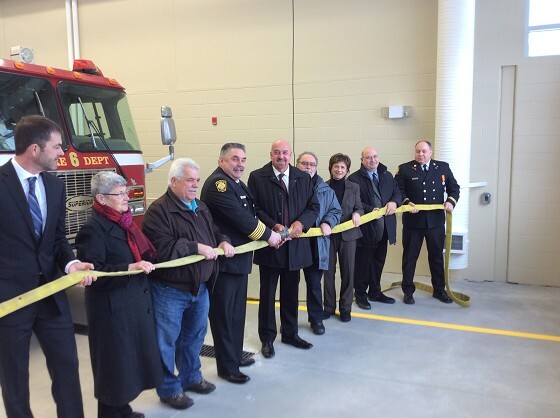 The second of Thunder Bay Fire Rescue’s two new modern Fire Stations was recently commissioned. The new Station 6, located on the corner of Frederica Street and Neebing Avenue, is part of the City’s six-project plan to improve facilities, infrastructure and response times for Fire and Emergency Medical Services (EMS) in the community. Station 6 replaces the 64-year-old Brown Street station which hasn’t been able to accommodate modern fire apparatus’ size and meet crew safety requirements for some time. The new site, at 1710 West Frederica St, represents a significant improvement to include all of Westfort and much more of Neebing in meeting the six-minute response goal. Some sustainable features include: • Expanses of natural lighting in the vehicle storage area • Building materials with a recycled component • Increased levels of insulation • Recycling of construction waste • Low VOC paints, sealants and adhesives, and • Energy efficient electrical and mechanical systems all tied to a web-based building automation system. The buildings are projected to use 45% less energy than a similar base building. This project also meets the Gold Standard of the City’s Clean Green & Beautiful policy. “I am thrilled to see this facility open in its new strategic location for the citizens of Westfort and more of Neebing, as well as the firefighters who diligently serve the area,” said Westfort Ward Councillor Joe Virdiramo. Thunder Bay Fire Rescue has eight fire stations and a training centre complex serving a population of 110,000. “ The importance to the community of this new station is we will decrease the response time to I think about 6 minutes which is a safety issue. The refocusing of the Brown Street Station to an ambulance centre will provide citizens with proper services. When I first ran for council my goal was to put Westfort on the map and that has been successful.” “ My next goal is to get a 55 plus centre and youth centre here and that is going to happen hopefully in these next four years. We need the services. The next thing is the renovations to the police station to provide service the community needs.” “ We have a good group of councillors, a great team in administration and we work together as a team. There are no bosses and we work for the citizens of Thunder bay. Thunder Bay is moving forward." A unique feature of the new building is the front door will be open 24 hours a day, 365 days of the year. They have a button inside which can be pushed and it will lock the door behind the person entering for safety reasons if someone was chasing them. It is a public safety area and secure. Then they can push another button to contact a fireman on duty 24 hours a day. There are four people on site at the station all the time except when they are on calls.